Having the proper finger size is essential when you are purchasing rings. There are many different finger sizes but at Silver 925 we keep to the Australian and American sizes, in simple terms J-Z and 5-14. Average female sizes range from M-P and gents T-X. 1. Use a strip of paper or string and wrap it around the base of your finger. 2.Mark the string or paper where it touches to form a complete circle. 3.Using a ruler or measuring tape, measure the length of the string or paper up to where it is marked. 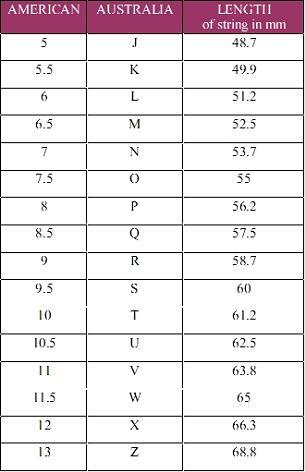 4.Using the chart below compare your measurement to determine your ring size.